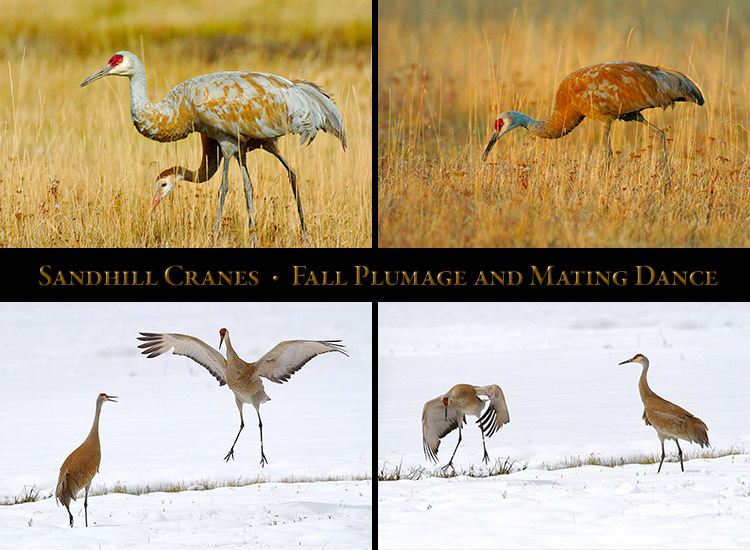 Fall Plumage and Mating Dance; Scenic and Assorted Images, and Composites. 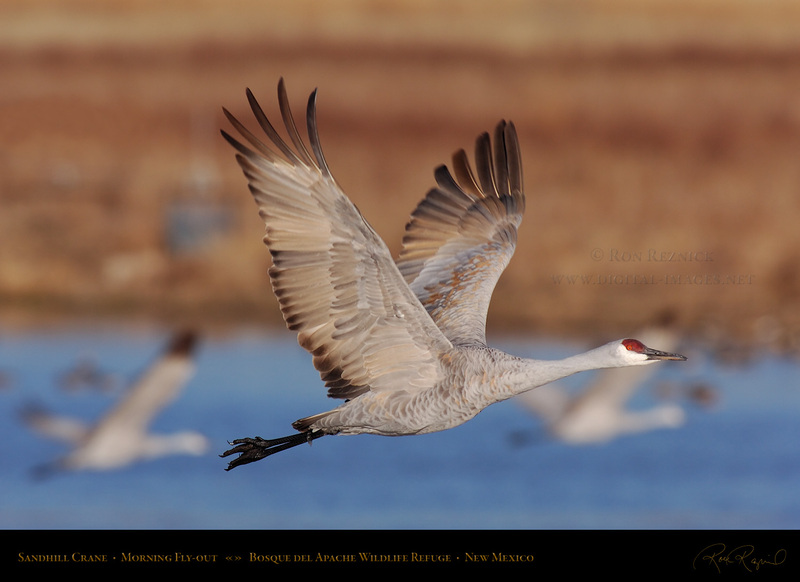 Click a Display Composite to visit that page. 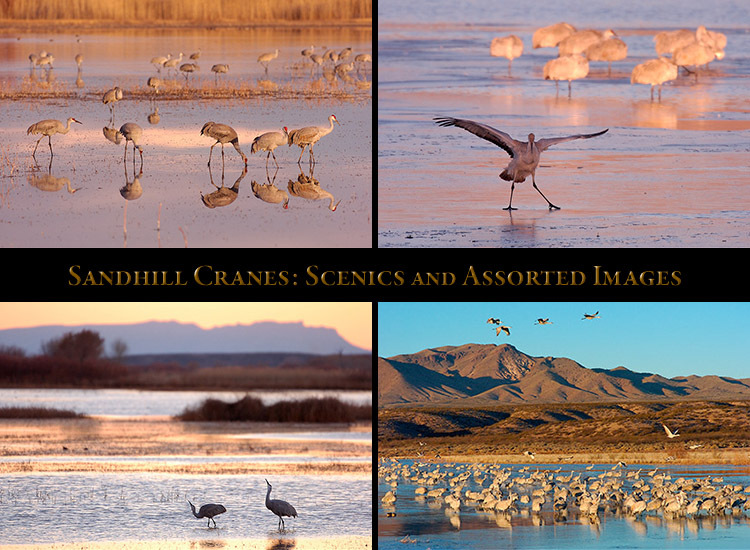 The Banner below leads to the Sandhill Cranes Collection where a Gallery can be selected. 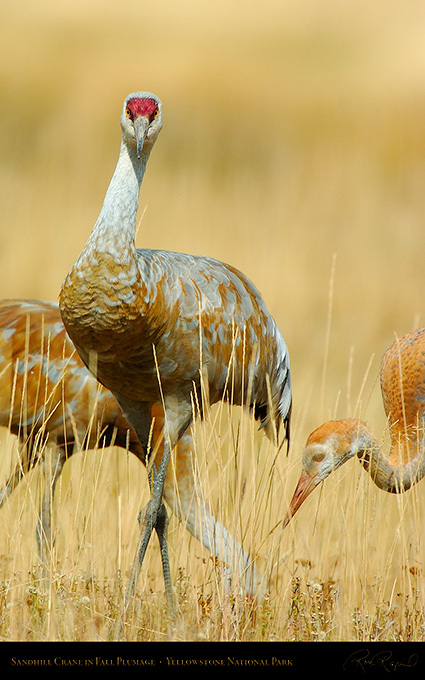 which is 1.5 times older than the earliest remains from most living bird species. Cuba and Florida. 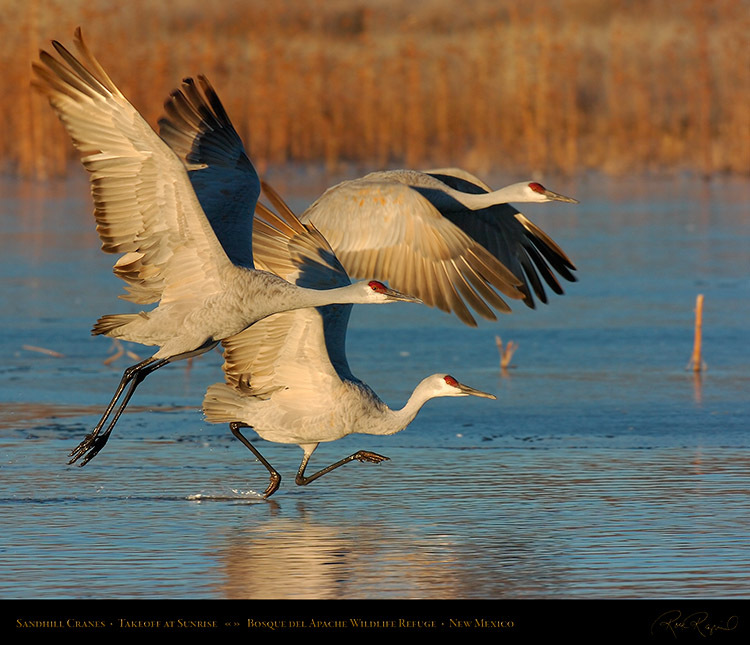 The migratory species breed in the northern US, Canada and Siberia. Two Cranes running together to gain takeoff speed in the golden light at sunrise. 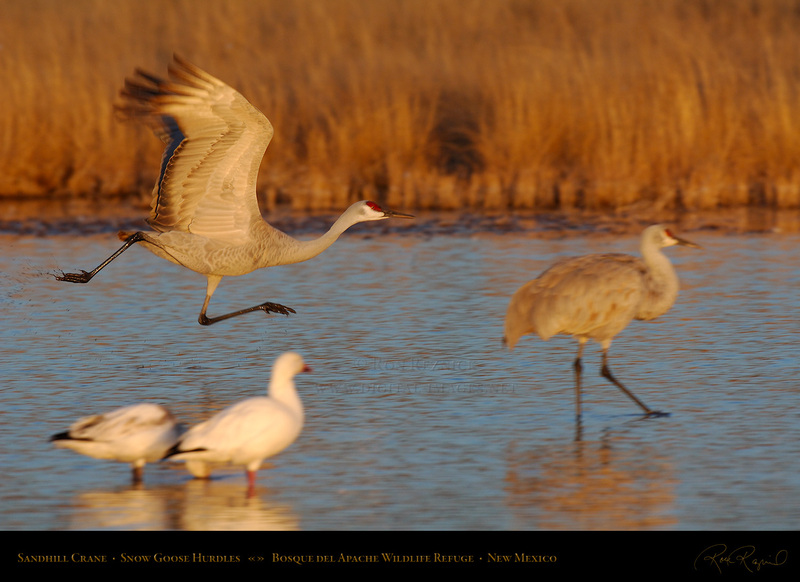 A Sandhill Crane practices the ever-popular Snow Goose Hurdles on a cold December morning. A Sandhill Crane shot just after takeoff (note the splash). 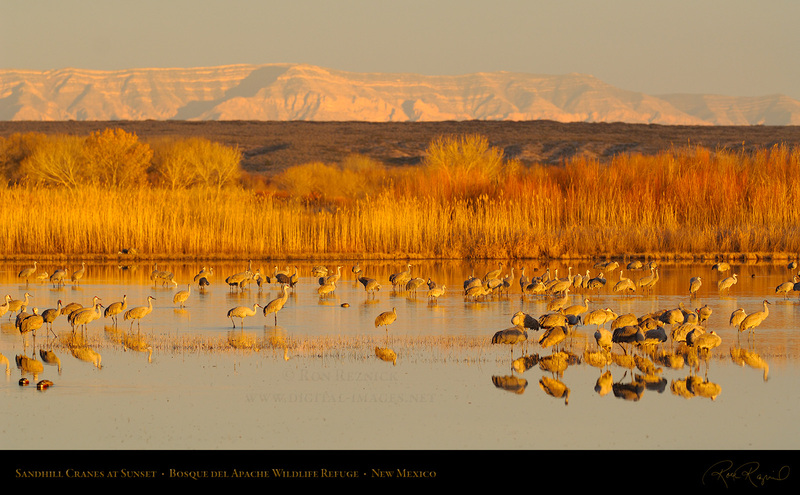 The light varies greatly in the first hour after sunrise on a clear morning. about an hour after sunrise. 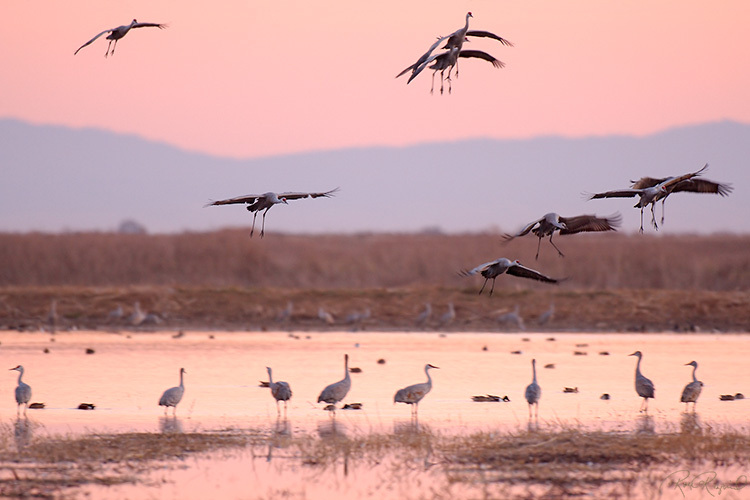 By then, most of the birds have flown to the fields. 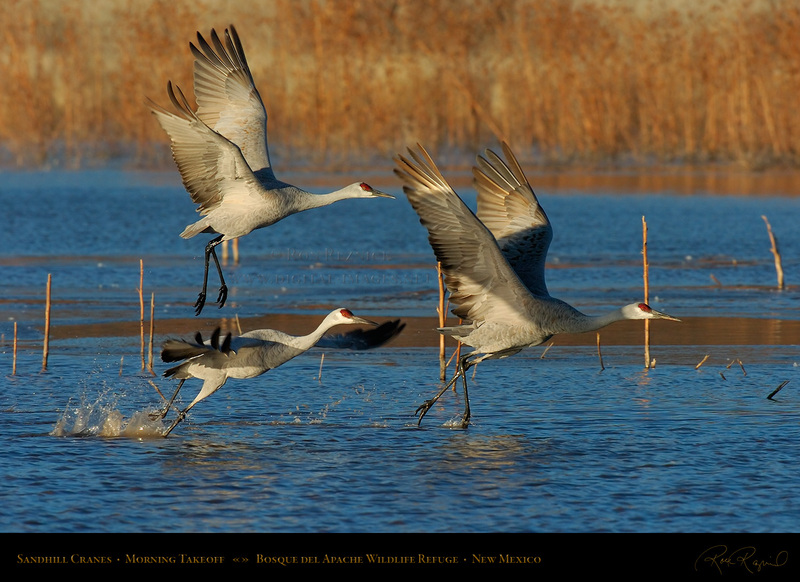 Sandhill Cranes spring into the air after a running takeoff on a December morning at Bosque del Apache. Sandhill Cranes leaving the Crane Pool at Bosque del Apache, shot at the moment of takeoff. 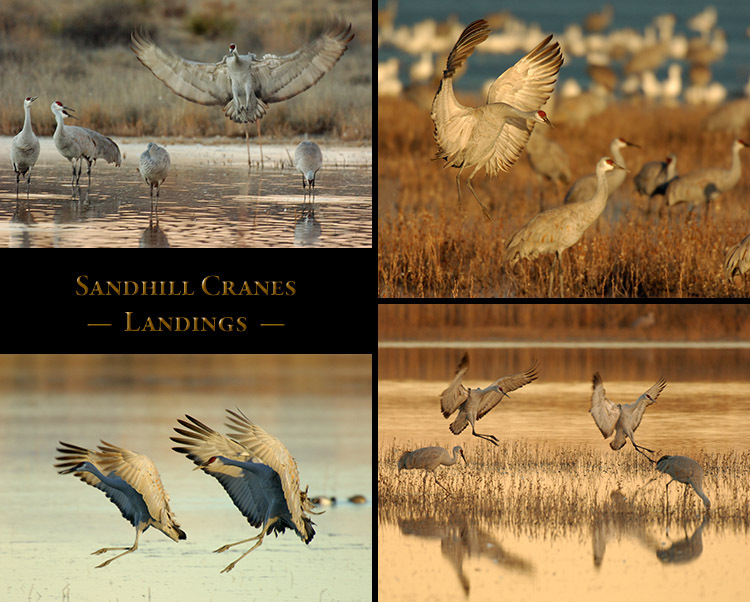 Three Sandhill Cranes spring into the air on a windy day in mid-December. 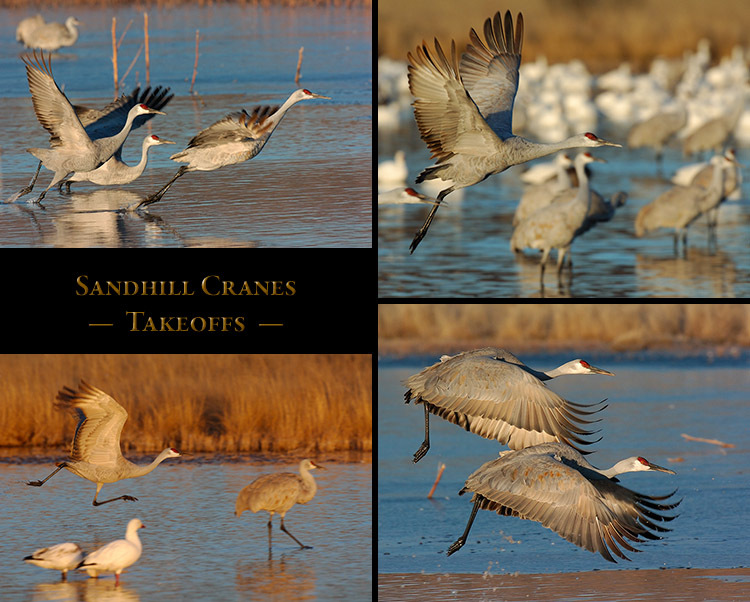 my efforts were rewarded with all three positions: the squat, the spring and the takeoff. 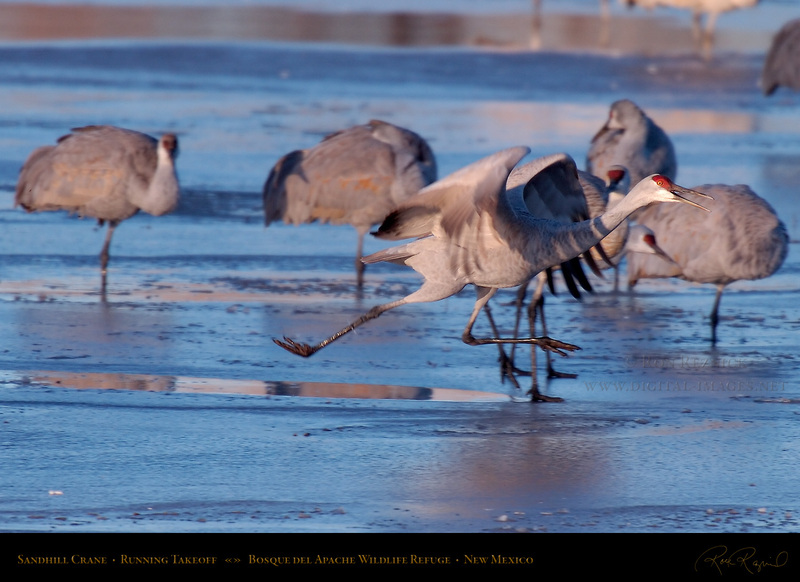 A Sandhill Crane runs across the surface of the ice to gather speed for takeoff on a cold January morning. The temperature had fallen well below zero the night before and it was still below zero until after sunrise. 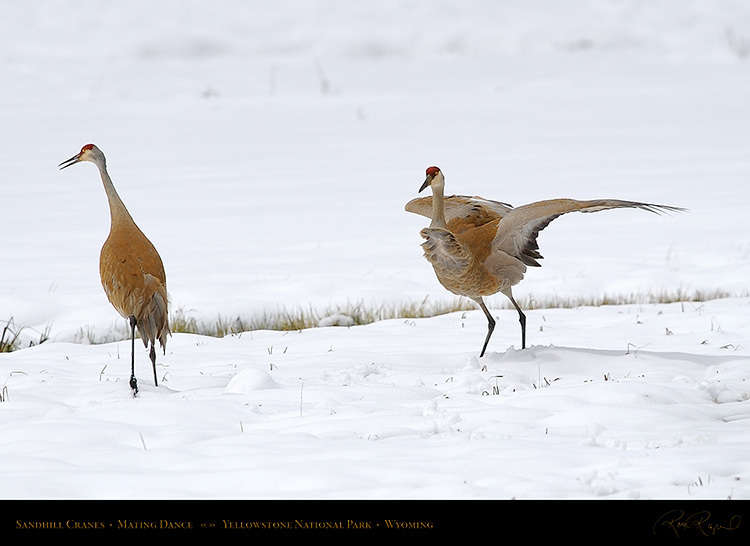 sticking to their legs, all while warming up before takeoff. They then run on top of the ice to take off. The Takeoff Sequences page displays sequential takeoff images and flight studies. 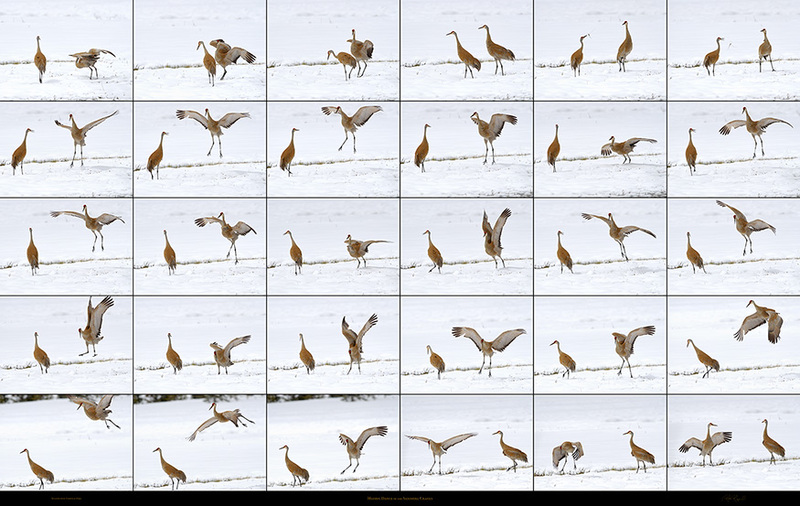 For this Overview, I will show single images from some of the displayed sequences. A Sandhill Crane in the characteristic position telegraphs his intention to fly by leaning into the wind. 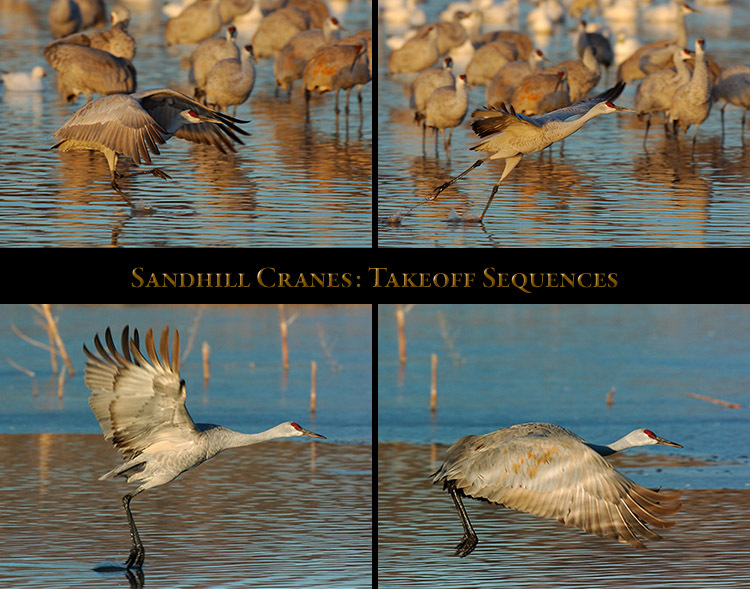 When Sandhill Cranes take off, they go from inaction to a burst of furious activity in a split-second. forward into the wind to estimate wind speed and warn photographers to lock focus on them. 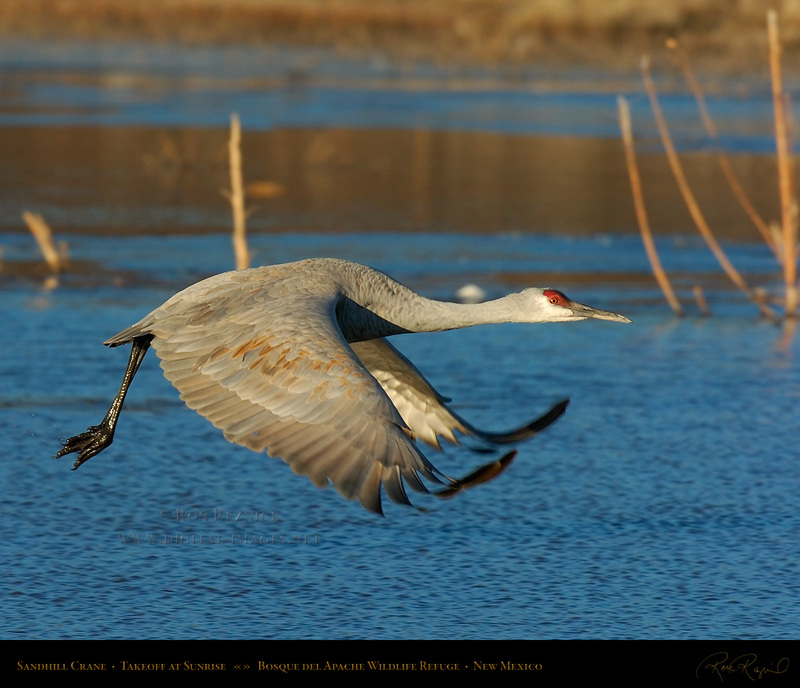 A Sandhill Crane runs across the pond while flapping his wings to gain takeoff speed. 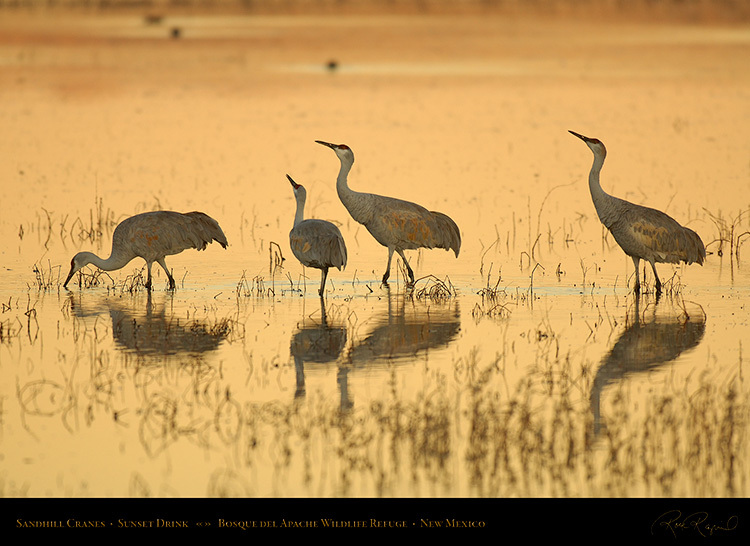 horizon reflect the sunlight at just the right time to cast a golden glow onto the water. Two Sandhill Cranes fly past another crane who is in the midst of a running takeoff. instant both feet are out of the water, with one toe dragging the surface as shown above. 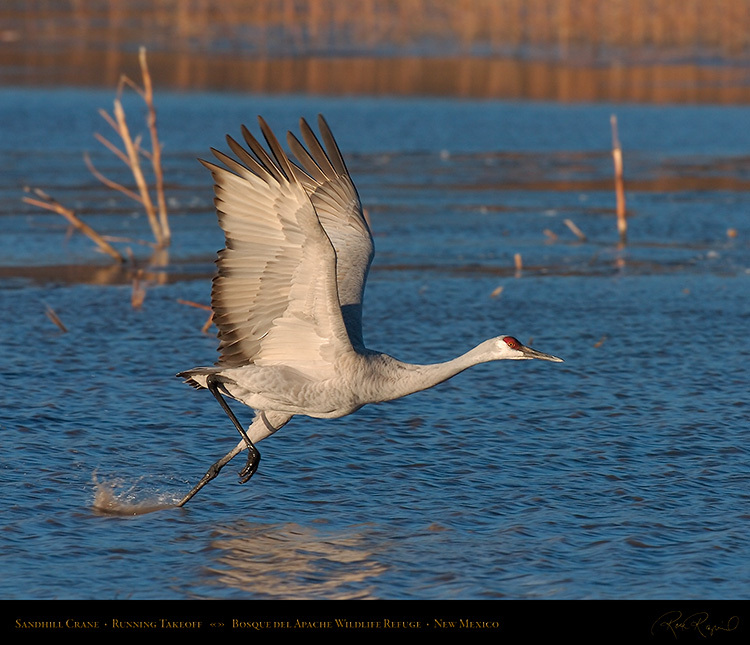 A Sandhill Crane runs on the water to gather takeoff speed and lift for its flight to the farm fields. air for more forward thrust and lift, and back on the upbeat while bending its elbows to reduce drag. The moment a Sandhill Crane springs into the air after a running approach and a hop, step and jump takeoff. 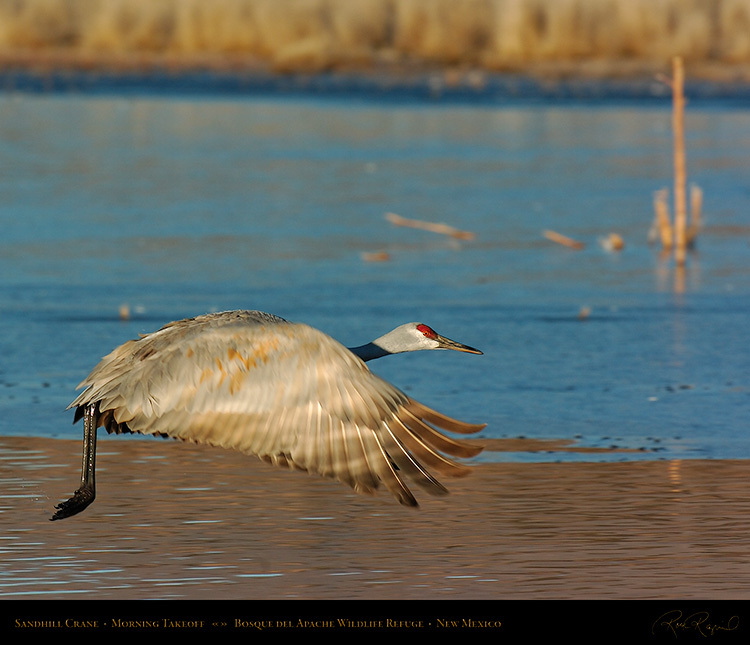 A Sandhill Crane leaves the Crane Pool at Bosque del Apache for its flight to the farm fields. 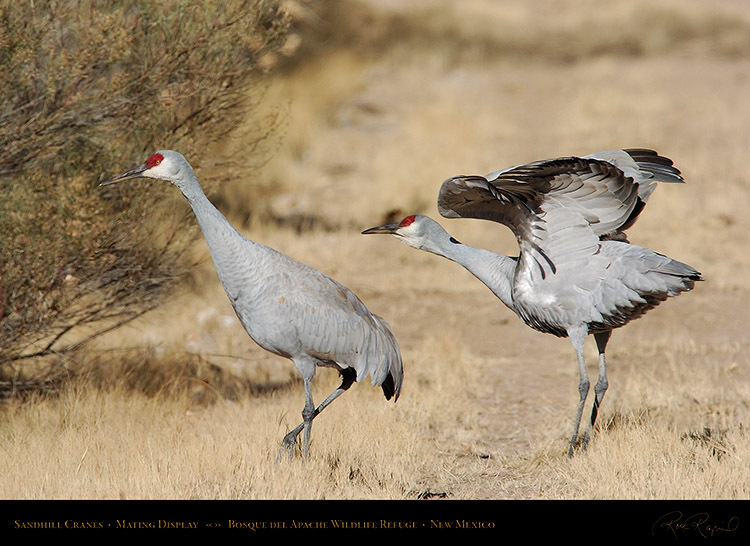 The end of the downbeat phase (providing most of the thrust), with the primary feathers flexing upwards. 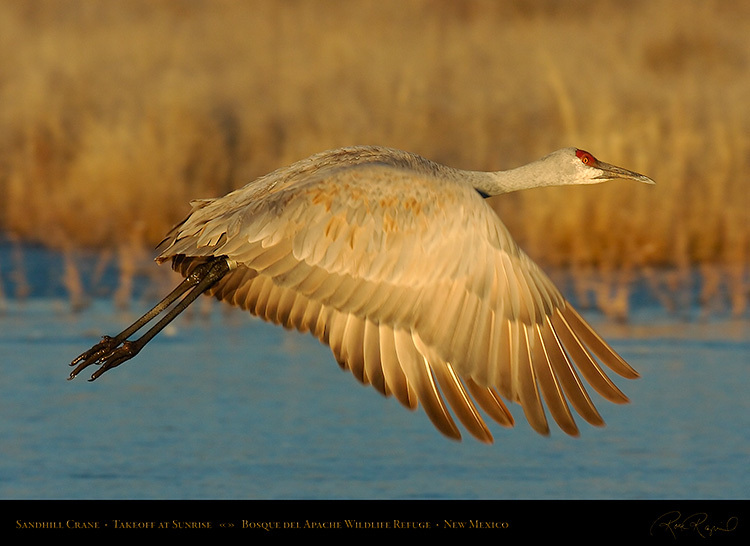 At full extension on the downbeat, primary feathers at the wingtips bend up due to the force of air pressure. generally requires a significant takeoff run for these large birds to generate the airflow to create enough lift. 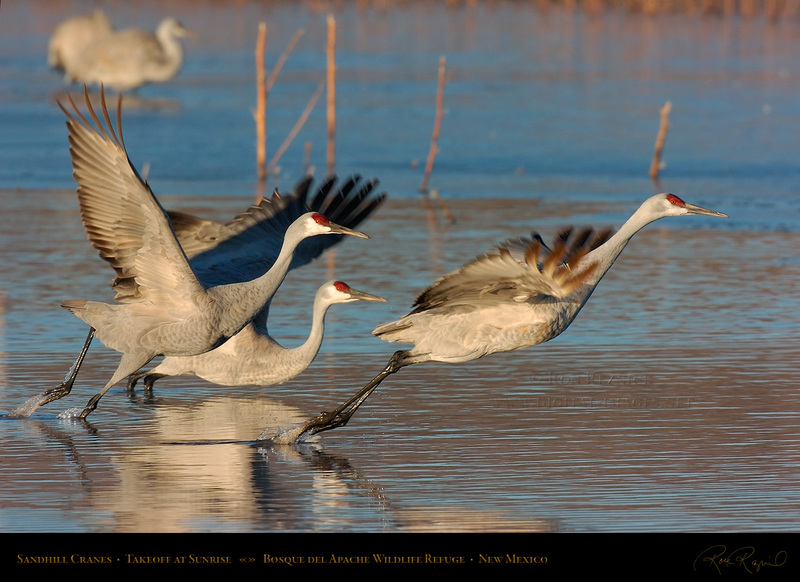 Once they are airborne, the Sandhill Cranes flap their wings with great power, scooping air for lift and thrust. A Sandhill Crane takes flight just after sunrise on a December morning at Bosque del Apache, New Mexico. 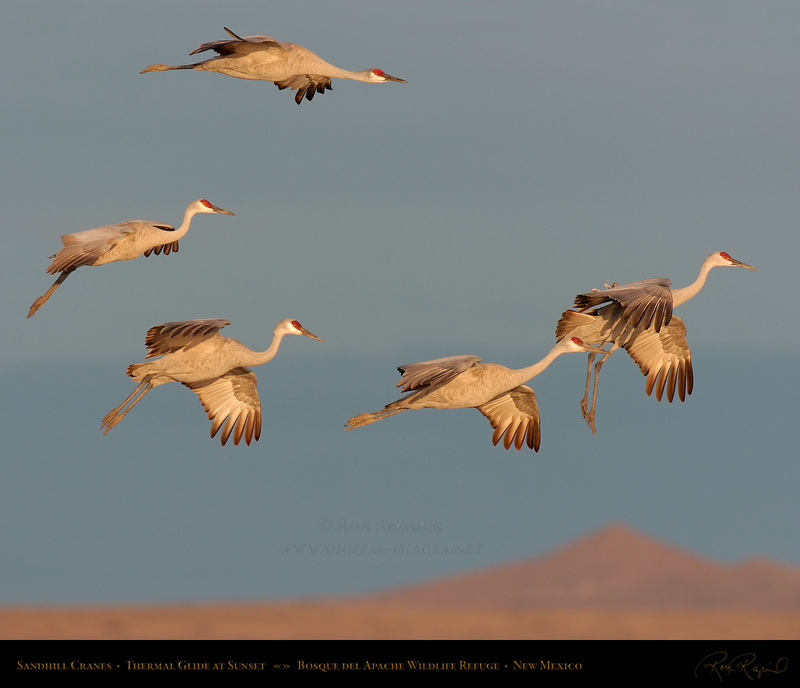 A Sandhill Crane flight portrait taken during the five minute period after sunrise in golden light. 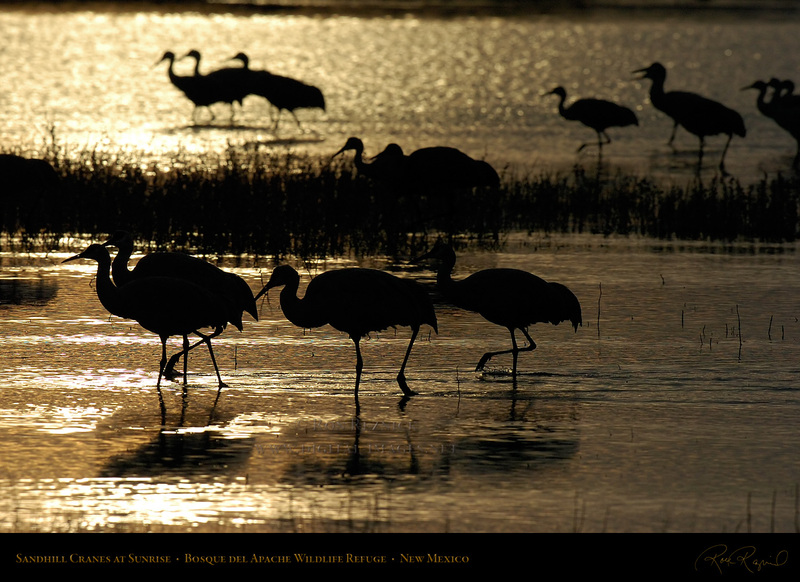 clouds must be high enough to avoid blocking the sun when it rises to the height which yields this light. 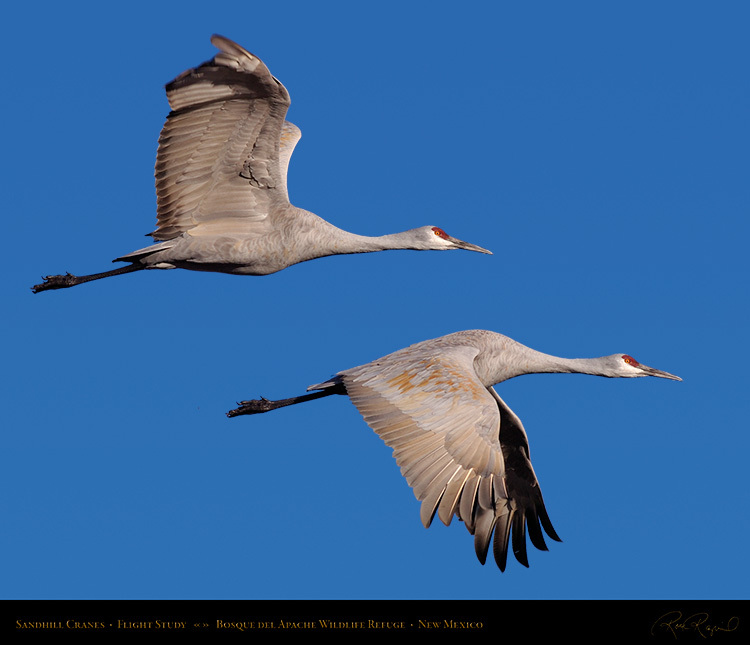 Two Sandhill Cranes fly from the Crane Pool in a beautifully synchronized formation. 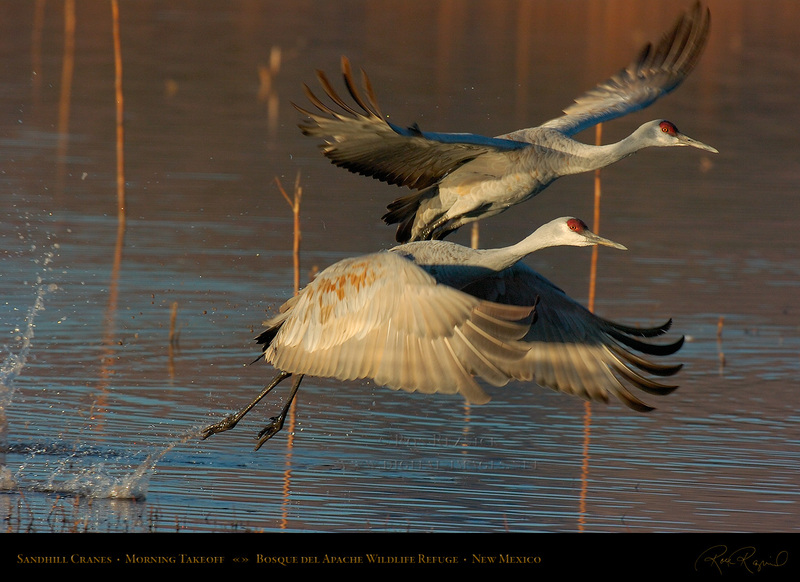 capture something special, such as a difficult timing shot with synchronized wing positions. 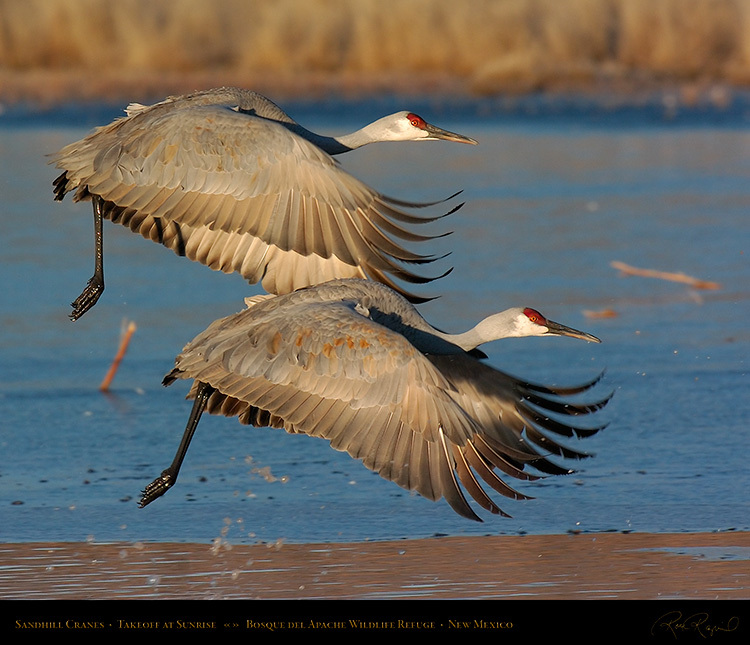 images... here the goal was also to capture synchronized full forward extension of the wings. 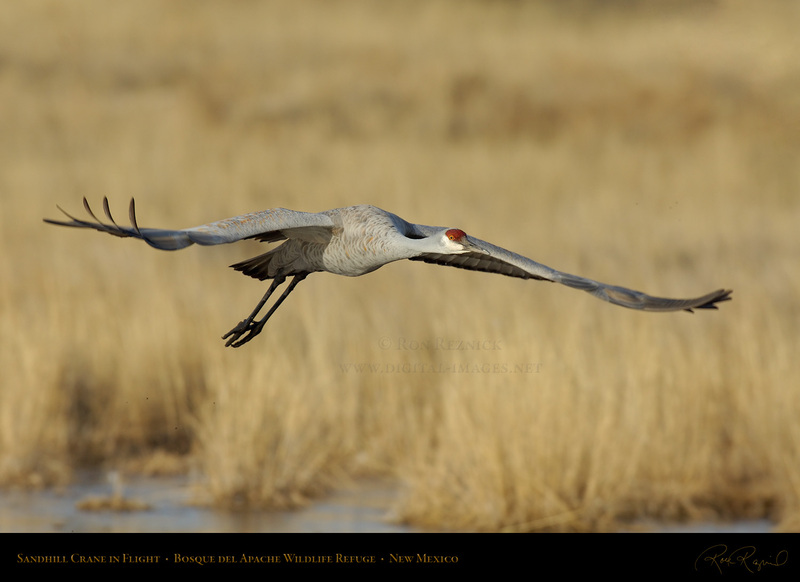 A Sandhill Crane displays an exquisite wing position as he flies out to the farm fields in January. he flies out to the farm fields at Bosque del Apache on a cold January morning. A close frontal flight portrait of a Sandhill Crane taken at eye level, just after takeoff on a February morning. 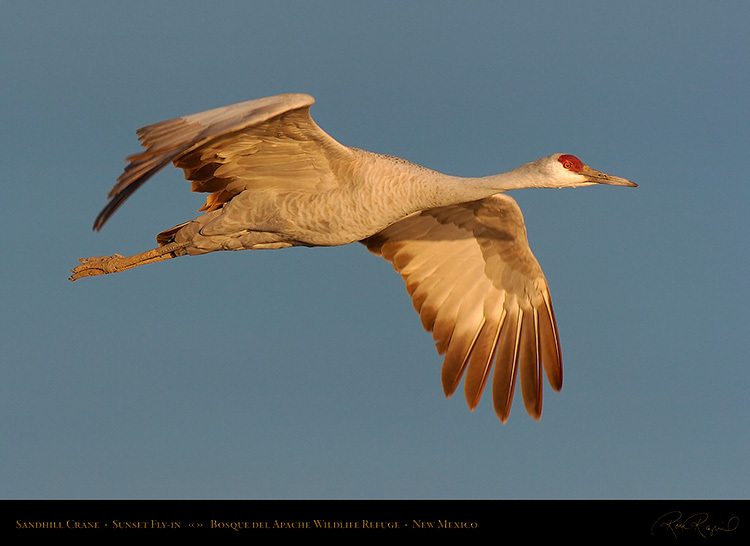 A Sandhill Crane is beautifully lit in a close fly-by past the Flight Deck on its way to the Main Pond at sunset. 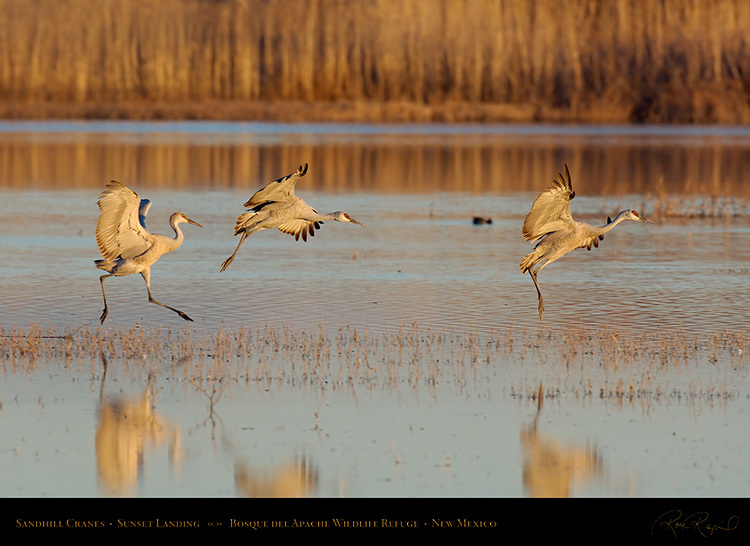 on their way to a landing on the Main Pond, just to the left of the Flight Deck at sunset in February. 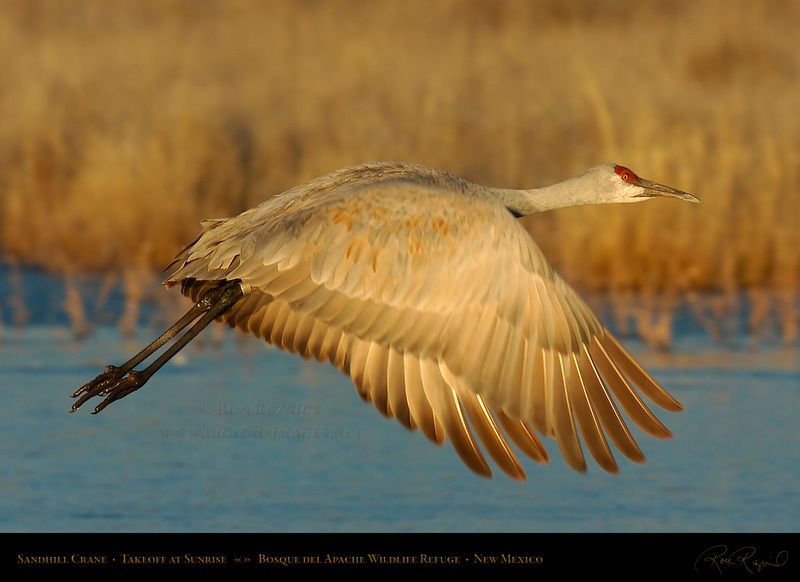 passes over a Cinnamon Teal at sunset on its way into the Main Pond at Bosque del Apache. 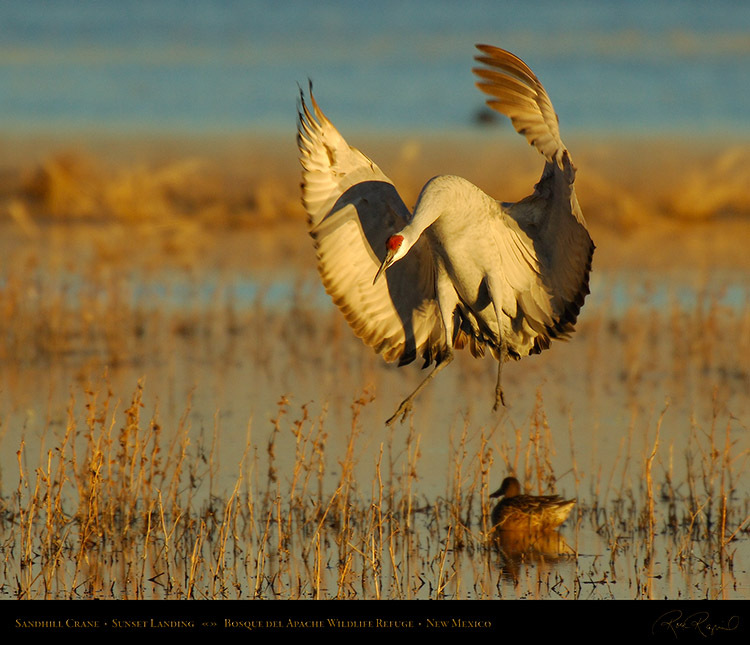 A Sandhill Crane comes in for a “full-parachute” landing, taken from the perfect frontal angle at sunset. One crane performs an elegant dance at sunset while two others land just ahead of him in the Main Pond. 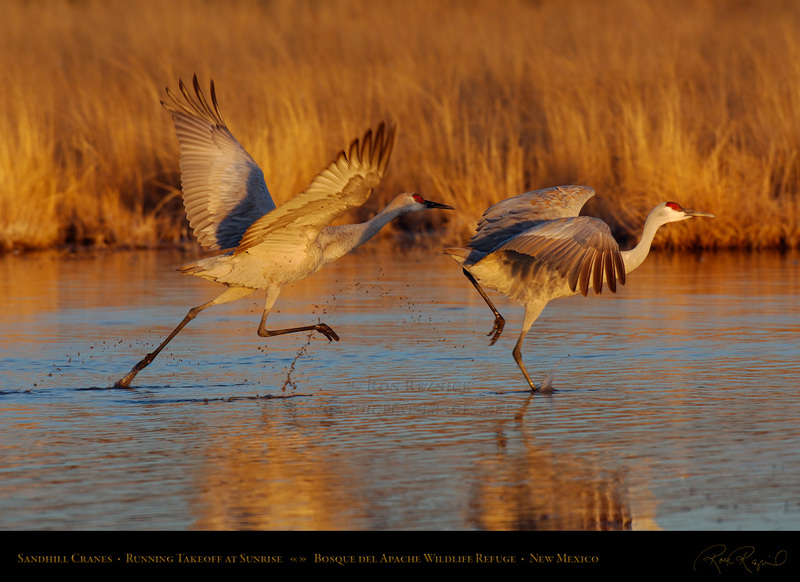 Two Sandhill Cranes float in for a sunset landing in golden light on the Main Pond at Bosque del Apache. A group of Sandhill Cranes float in for a landing in the waning light at dusk. 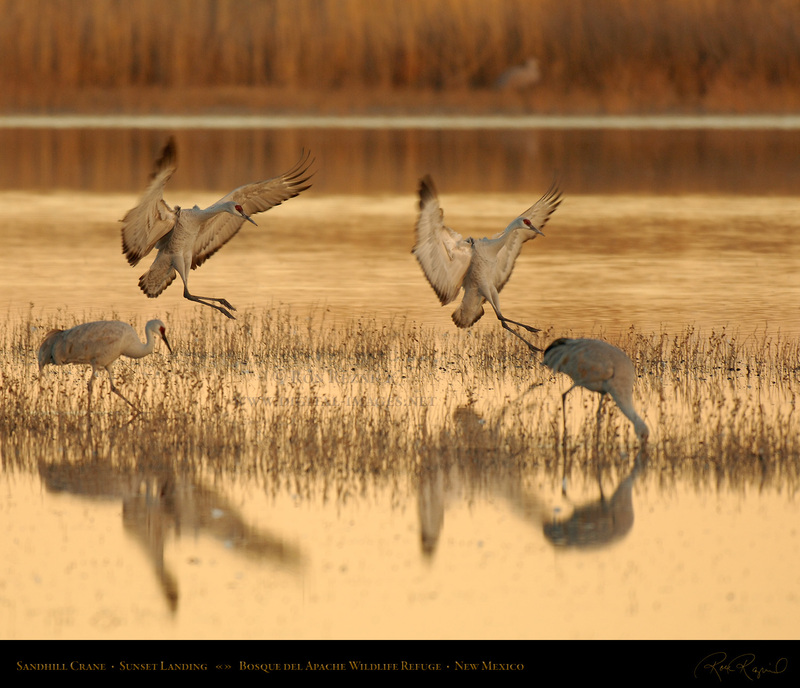 This was an extremely challenging shot, taken at 1/80 second at f/4 with a 500mm lens. 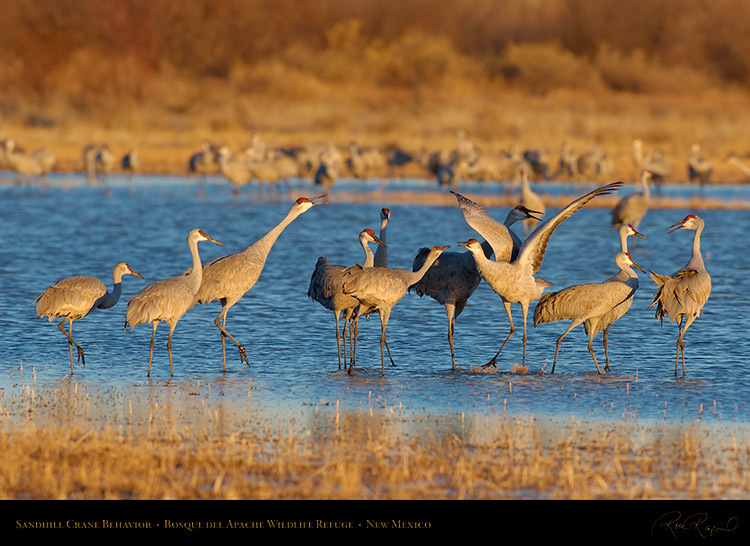 made it difficult to keep the group of cranes in the extremely shallow focused field. 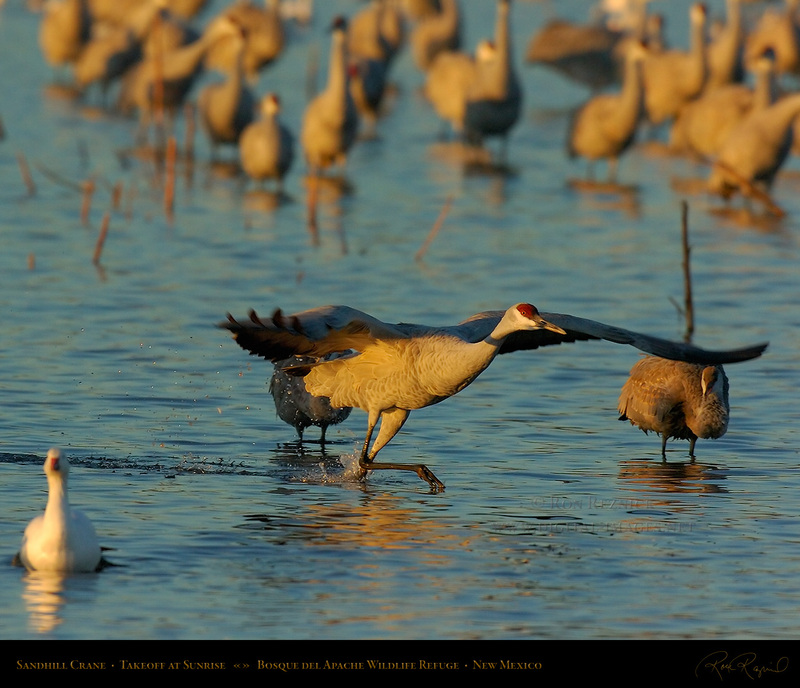 This combination of issues made achieving a sharply focused image interesting. 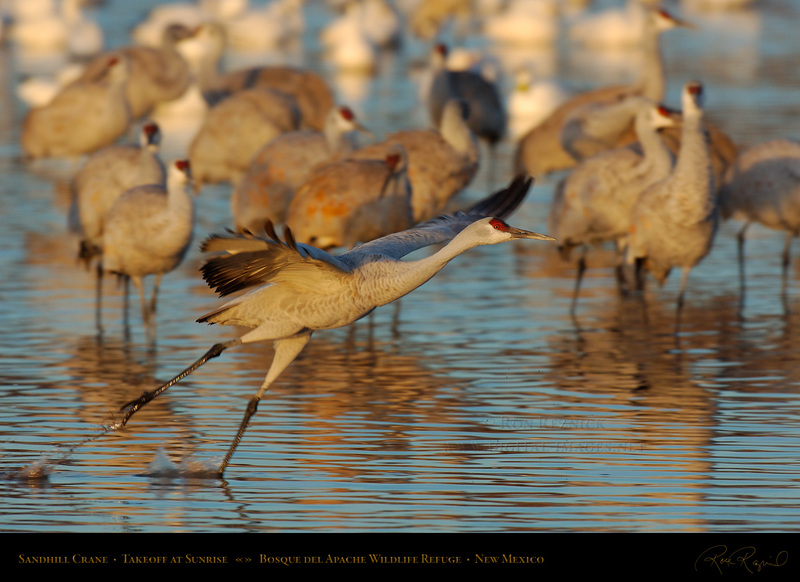 A Sandhill Crane touches down for a landing in the soft golden light at dusk (1/100 @ f/4, 500mm). 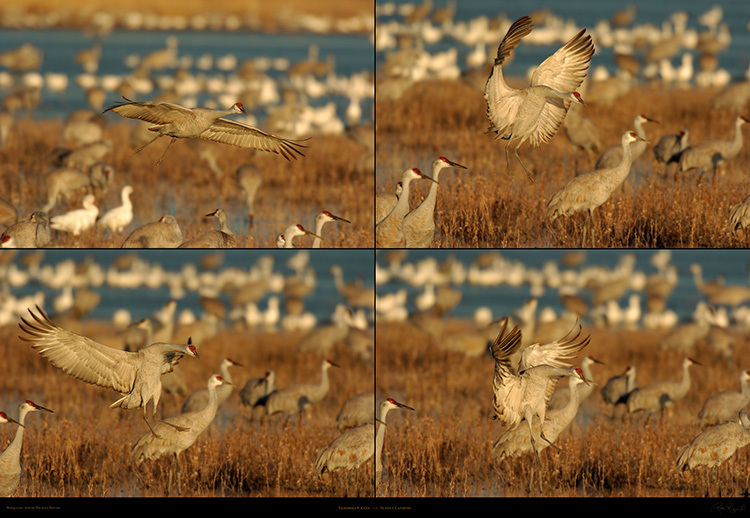 the reciprocal of the shutter speed is 1/6 to 1/4 of the focal length (very slow for a 500mm lens). 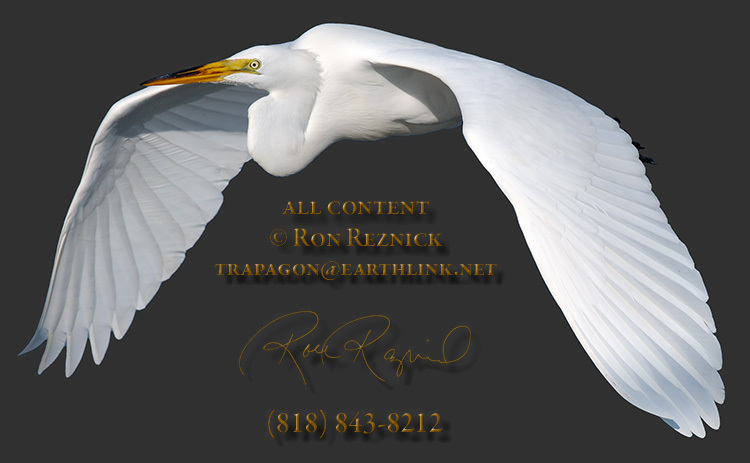 This combination of factors makes it imperative that you use every technical trick in the book. 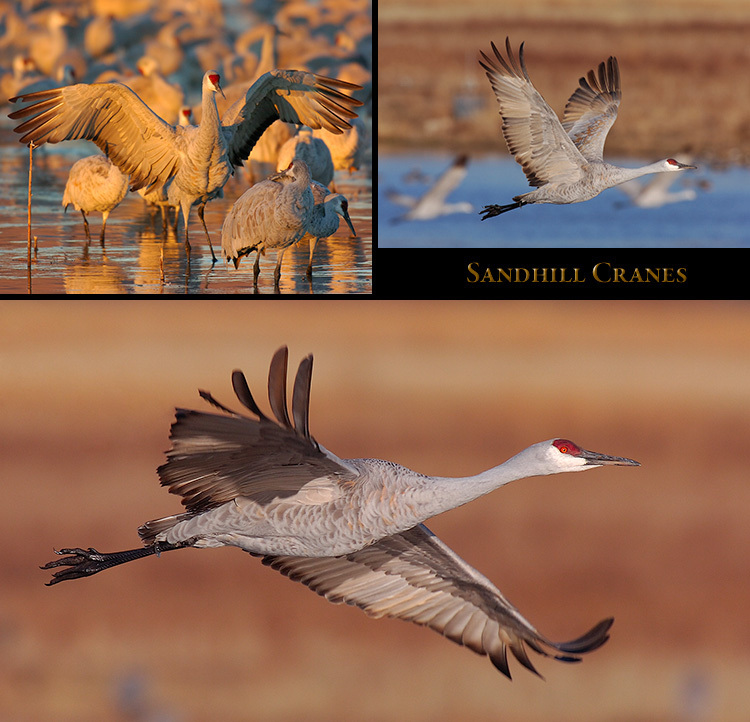 Two 1000 x 1600 frontal portraits of Sandhill Cranes in Fall plumage at Yellowstone in October. Long-beaked birds such as the Sandhill Crane look quite comical when viewed head-on like this. deep reddish-brown tone, similar to the red-ochre tint used since the Neanderthal period. grass in Yellowstone National Park, late morning in early October. 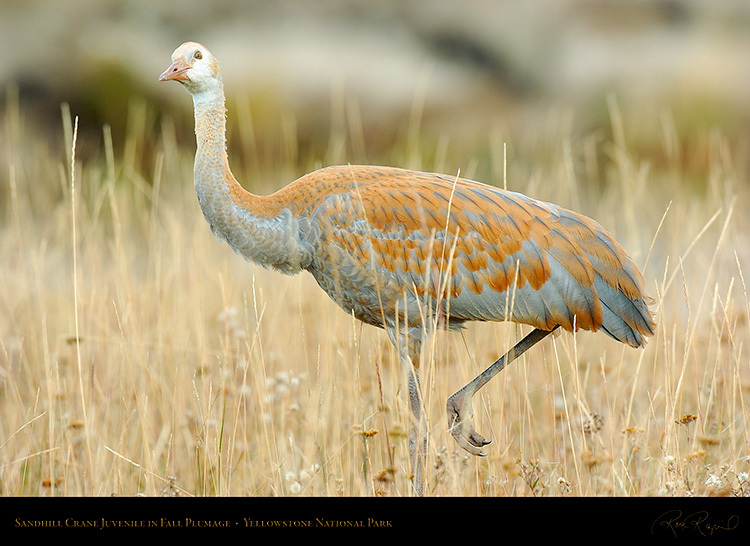 Note the extensively tinted feathers. 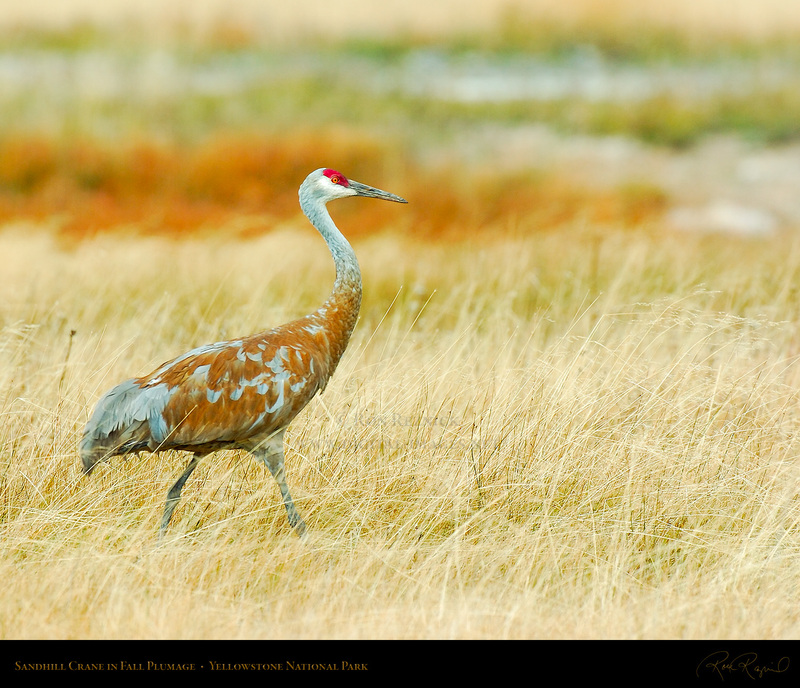 A juvenile Sandhill Crane in Fall plumage at Yellowstone National Park at mid-day in early October. 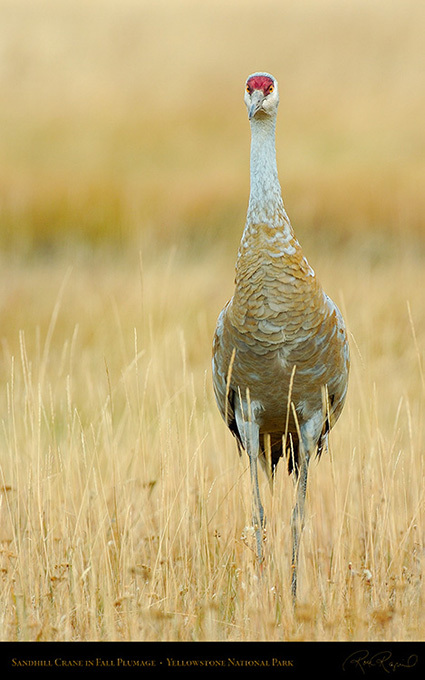 The juvenile seemed curious about the clicking sound of the camera, cocking his head for a better look. 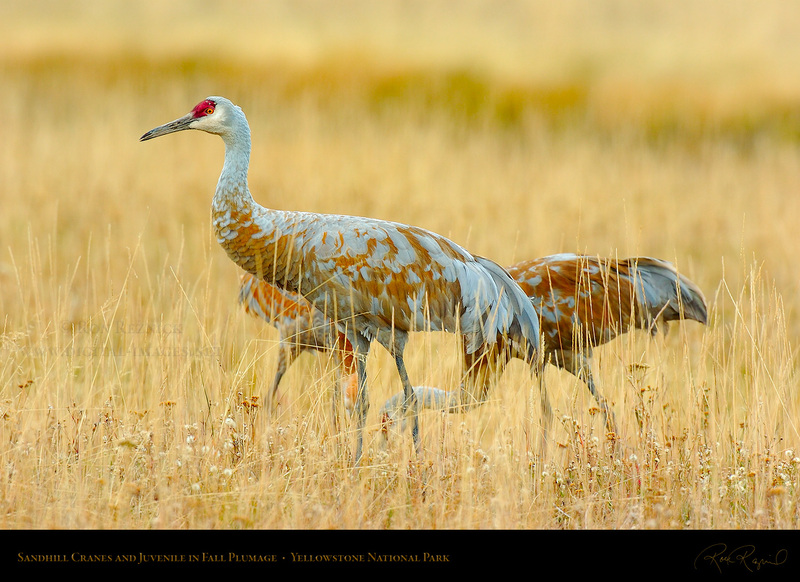 A Sandhill Crane in Fall plumage struts in the autumn grass in Yellowstone at mid-day in early October. 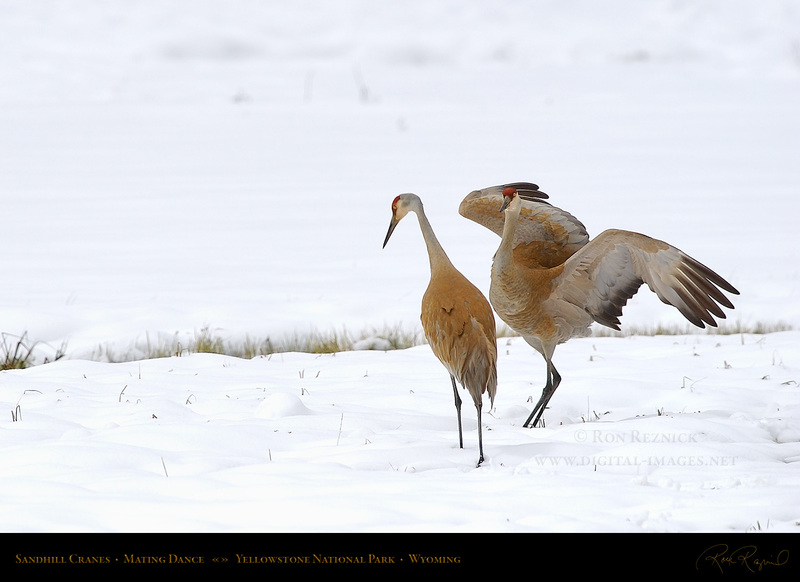 A male begins a courtship dance in Yellowstone National Park in May. 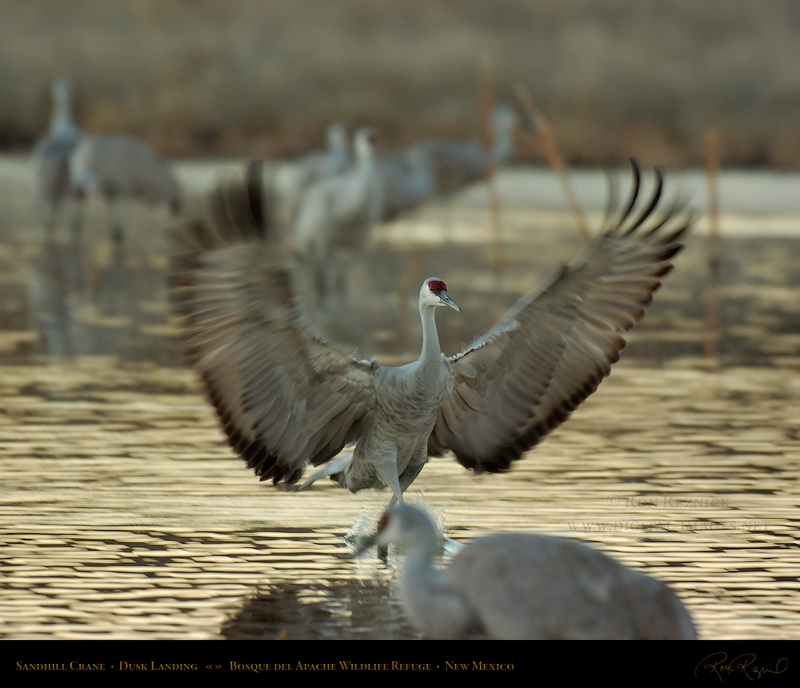 He stands and with his wings extended in display, fluffs his neck feathers. 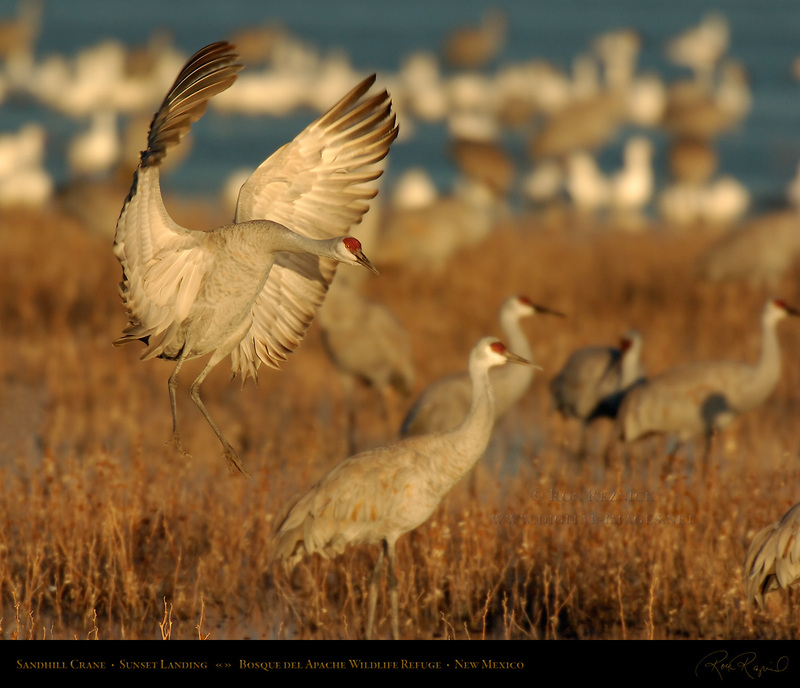 He then jumps into the air, performing more intricate moves with each leap. 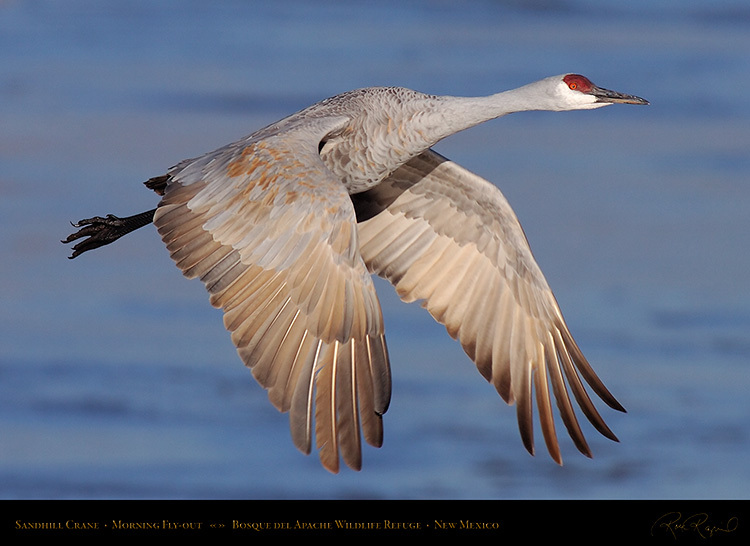 The male lands and with his wings extended, lifts his chest feathers in a full display. 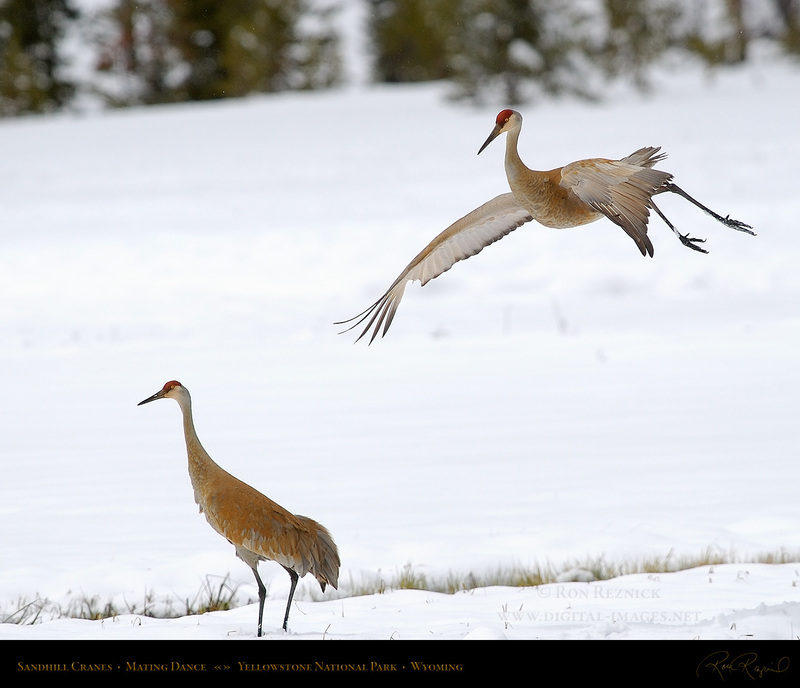 the male continues to jump higher and higher into the air, lifting his tail end high at the top of his leap. 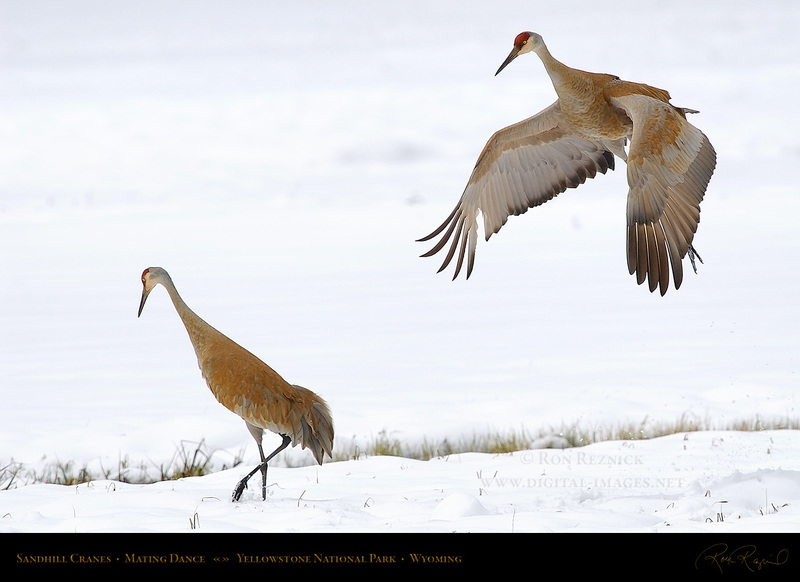 The male leaps high in the air while the female looks for nesting material. At the apex of his leap, the male lifts his tail into the air for additional style points. 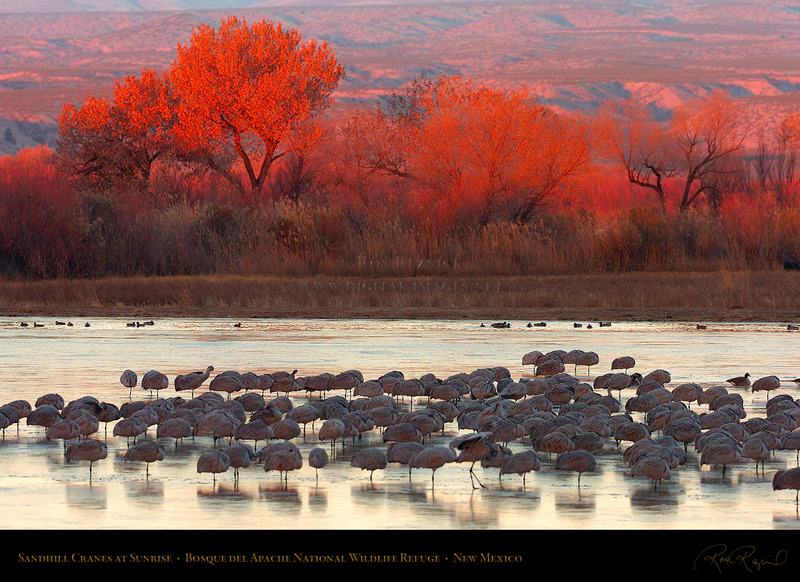 Bosque del Apache as the first rays of sunrise bathe the Cottonwoods in a red-orange glow. balance on the ice at sunrise on a brutally cold January morning at Bosque del Apache. Sandhill Cranes in silhouette at sunrise, crossing the Main Pond at Bosque del Apache, New Mexico. 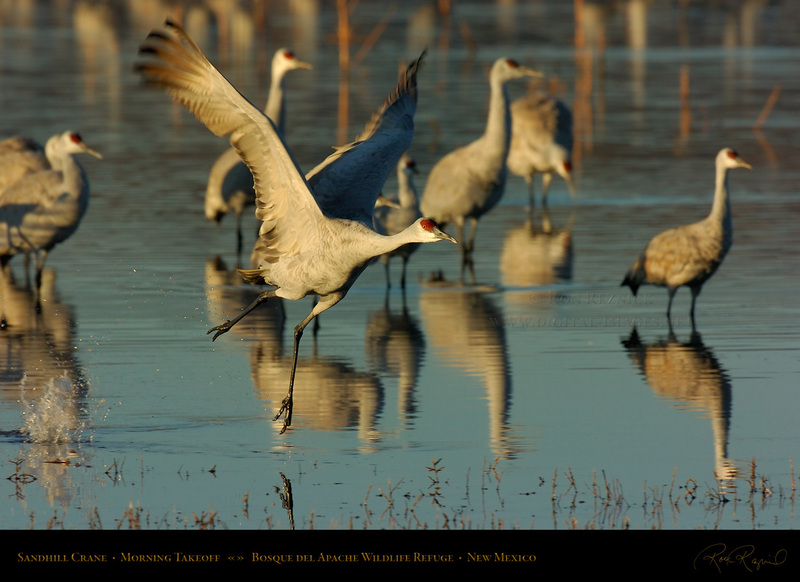 A Sandhill Crane performs a courtship display for his lady bird in late December at Bosque del Apache. Sandhill Cranes posturing and discussing their day at sunset on the small Crane Pool at Bosque del Apache. A group of Sandhill Cranes drinking on the Main Pond in exquisite golden light at sunset. 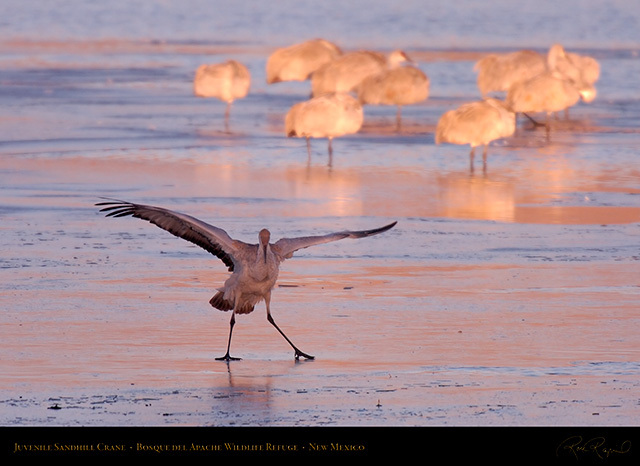 onto the water, and the color transitions from a yellow-gold through peach and mauve. 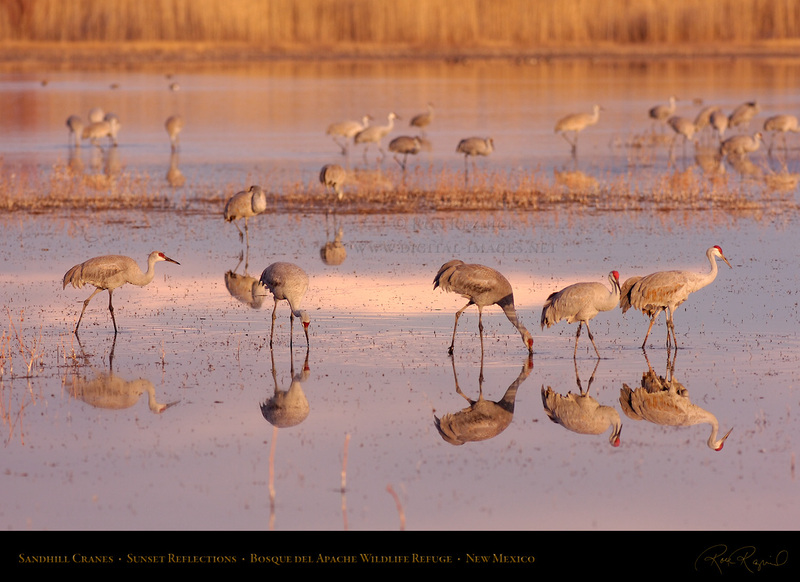 A group of Sandhill Cranes are reflected in the Main Pond in beautiful light after sunset in February. of the Mating Dance of the Sandhill Cranes, taken in May at Yellowstone National Park. 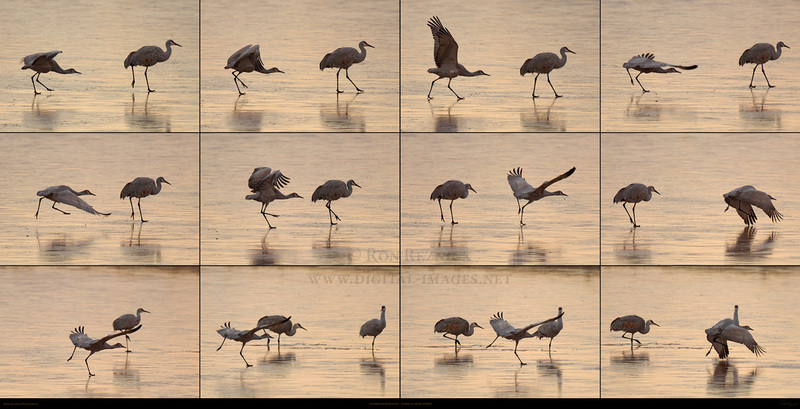 sequence on a cold January morning, in which a juvenile attempts to achieve balance and traction on the ice. A 1600 x 829 version of the XXXL Composite (9886 x 5125) showing a 12 image flyout sequence. 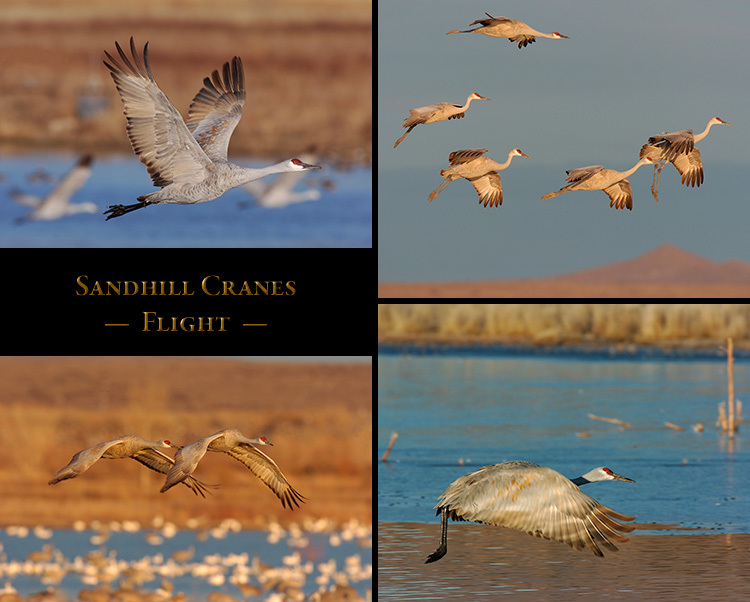 The Sandhill Crane runs on the water to gather takeoff speed and lift for its flight to the Farm Fields. 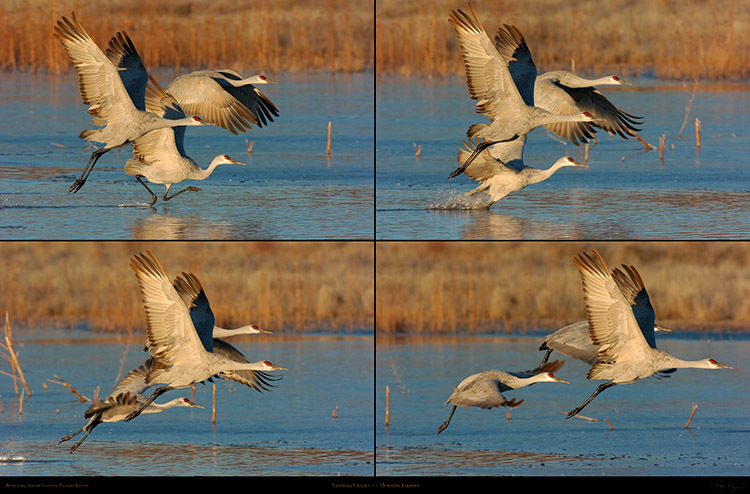 A 1500 x 987 version of the XXL Composite (4938 x 3250) showing a four image takeoff sequence. 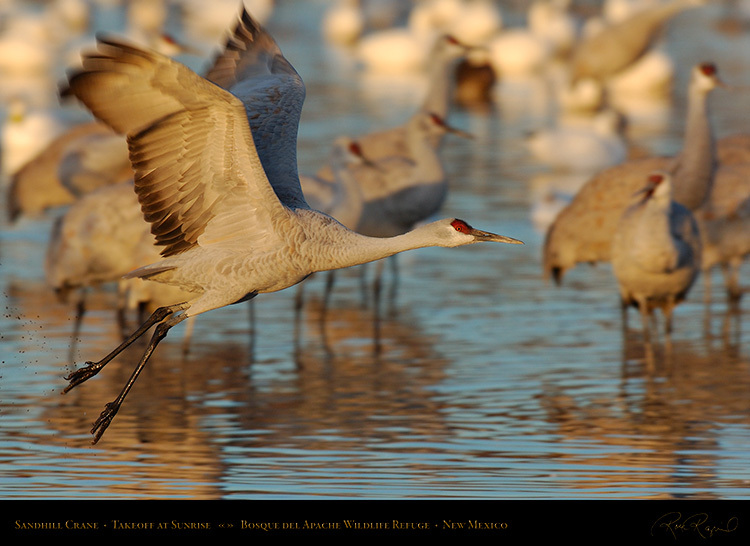 from a Morning Flyout Sequence, and the 6th image, an isolation portrait taken after the 5th image. 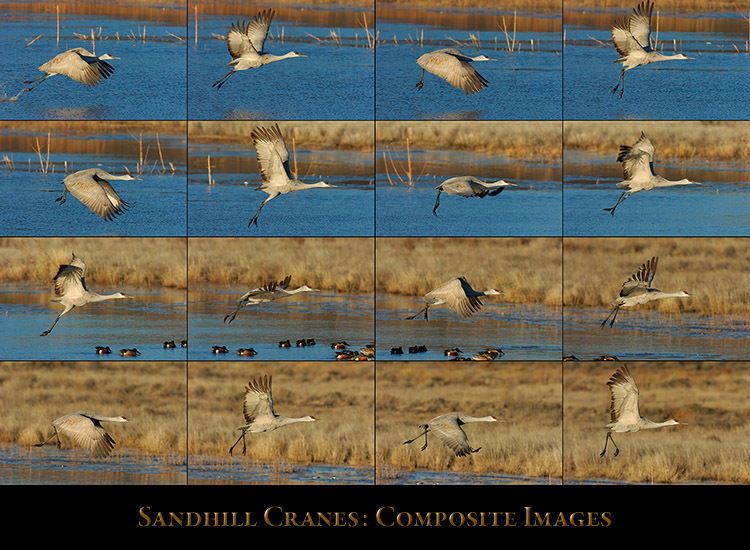 A two image overlay composite of a Sandhill Crane in a brilliant blue sky on a cold December morning. The portraits were taken at near full extension on the downward beat and 2/3 extension on the upward beat. 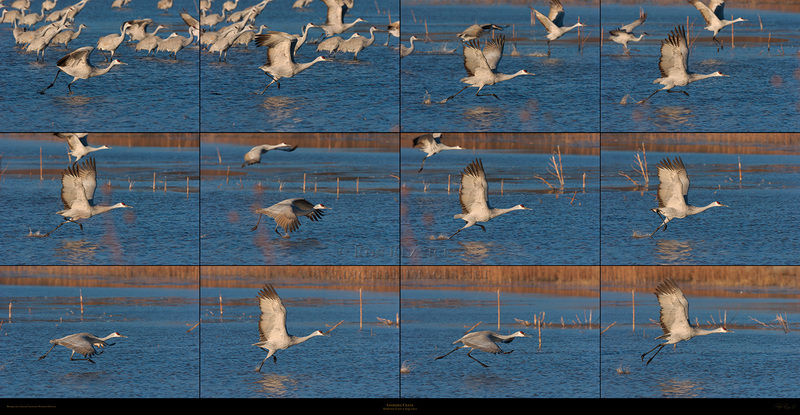 There is a 3:2 aspect ratio XL version of this flight study composite available (the XL version is 3000 x 2000). 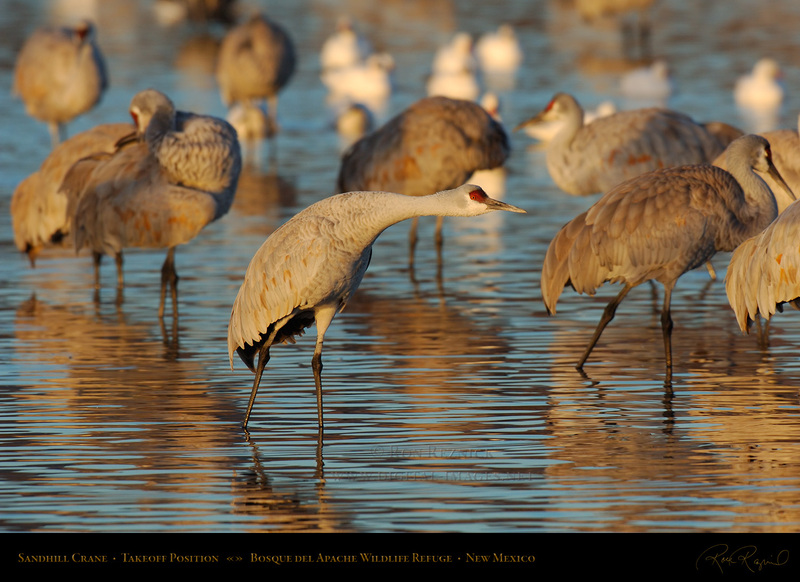 taken at the perfect frontal angle at sunset, in the marsh in front of the Main Pond at Bosque del Apache.